Sailing a yacht charter in Greece on the Ionian is all about relaxation and pleasure. Whether the gentle sea breezes that rarely get above a Force 5 or the stunning scenery and sea, you will be soothed by all you see and feel in this stunning part of the Greek Mediterranean. Where in July and August on the Aegean the sailing can verge on the extreme, you can comfortably take your young family out to sea on the Ionian on most days. The kids will love the beaches and walks through the countryside, while the parents will enjoy the long lunches with the cuisine peculiar only to the seven major islands of the region. 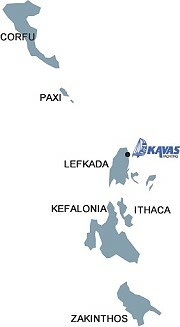 There are seven major islands in the Ionian, and these are known as the Eptanissa - literally “seven islands” in Greek. These seven major islands are quite large - up to 63km long in the case of Corfu and have mountains as well as the lowlands and beaches you will encounter from the coast. Ashore you will find a host of herbs and fruit trees that are rarely seen elsewhere. Myrtle is a low bush with sweetly scented leaves that was mentioned in the Greek Mythos: The nymph Mirsine had a race with the goddess Athena and won. In a rage, Athena killed Mirsine and her body was transformed into a myrtle. It has close associations with love, marriage and death, having been associated with the Greek goddess Aphrodite. The tall, evergreen Cypress trees are known as the 'finger of God' and you will see at least one in every village, complete with its very own mythos. The geology of the region is ever changing owing to the active tectonic plates. Even so it took thousands of years for people to understand why the sea goes straight through the coast around Katavothres on Kefalonia. This peculiarity occurred even after violent earthquakes, and puzzled people from ancient times - until 1963. A group of Austrian geologists poured dye into the water where the sea entered the rocks and had a look around Kefalonia to see where it emerged. It took 27 days to travel 17km through an underground tunnel beneath the island and after appearing at the freshwater Melissani Lake, emerged from Karavomilos Lake to the northwest of the island. The purity of the colour of the Ionian has to be seen to be believed. You will see the sea bottom from up to five metres or more - very few pollutants will muddy this view. One of the hot destinations for sea swimming is the islet of Antipaxos off Paxos, but this can be incredibly busy with your fellow boaters in the peak of summer. Given the vast coastlines of the main islands in the Eptanassa chain, why not find your own quiet spot to enjoy the stunning waters? 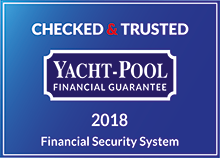 On a Greek yacht charter with Kavas Yachting the choice is really down to you. You will find all sorts of marine fauna in the Ionian, including turtles and dolphins. Zakynthos is home to Loggerhead turtles (caretta caretta) who lay their eggs on the southern coast of the island. If you have been to the Greek mainland before, the first thing you will notice when in the Ionian islands is the accent - ruled for 600 years by Venice, the islanders speak Greek with a singsong Italian accent. If you speak Greek you will spot dozens of Italian words that have been inserted by the Venetians when they ruled over the region. This is not to say that if you speak Italian you will understand them - this is just their dialect. With the centuries of foreign (Ottoman, British and Venetian) rule comes all sorts of cultural differences to mainland Greece that really make the Ionian a region worth visiting for its nuances. The food is influenced by foreign colonials as is their music and even architecture. You will hear different folk music from the Ionian Music School which is very classical in origin, said to have come from Byzantine influences - these are played by groups who use the violin, guitar and laouto. The Venetian influence has Kantades bands of Zakynthos. What this means is that you will be regaled by a vast array of traditional music that will often entertain you late into the night. Religious festivals aren’t just about piety and churchgoing - they are a very good excuse to have a party. Nearly every month of the year the Eptanissa islanders will find some excuse to get out on the street, drink too much wine and celebrate one festival or another. This is a very cheap way of entertaining the family while getting a bit of culture in to your visit to the islands! Do look out for the festival of Saint Spyridon in Corfu who is reputed to have warded off the Turkish siege in August 1716 - if you are around on August 11th, then watch the islanders celebrate like there is no tomorrow! Similarly you will find the Festival of Saint Dionyssios on Zakynthos as a wild and fun time. The Patron Saint of the island died in 1622 on December 17, but his body was moved and reinterred on the 24th August 1717. This means the Zakythos islanders have two excuses to celebrate this man of God! If you go inland on any island you will almost certainly find a celebration of some sort - you only need to scratch the surface lightly to find something. The people are laid back here. Time moves at a different speed on the Ionian islands. The peoples of the Ionian live longer, healthier and happier lives than many from Northern Europe. Perhaps we could all learn a lesson or two from them! The influences of foreign colonials include the food. Zakynthos has 'aubergines skordostoubi', a vegetarian dish of aubergines, carrots and potatoes in a paprika, garlic and vinegar sauce. Many locals eat this with cubes of the local cheese called ladotyri. Lefkadítiki ladópita is literally ‘oil pie’ and is found on Lefkada. This dessert is a cake baked with semolina and olive oil, sweetened with syrup and has almonds and sesame seeds to add to this sumptuous dessert. Don’t forget the legendary Zakynthos nougats that are made with egg whites, honey, sugar and almonds. They are served as small sweet sized lumps. Each one you taste will be a little jewel on your palate! These are only a flavour of what you will find - those with an adventurous palate will make discoveries wherever they travel. The weather of this part of the world is just what you would want from paradise islands - hot but not fierce, and with cooling winds that can waft your Greek yacht charter boat at a relaxed pace. In the heat of summer it is rarely as hot as baking Athens, but you will rarely need more than a light shirt in the day or evening. In the spring and autumn months you will get your fix of the sun to, with temperatures in the 15-20 ℃ range. The rains start coming in in Autumn and these bring with them a noticeable greening of the islands. The great thing for people taking a yacht charter holiday on the Ionian with Kavas Yachting is that the winds are essentially sea breezes that pick up at around 8 in the morning, find their peak at around lunchtime, before dying to a zephyr in the evening. This makes for near perfect if gentle sailing that will never scare the occasional sailor and will beguile you to come again and again for more adventures on these beautiful Greek islands. There are two big modern marinas in Ionian, in the islands of Corfu & Lefkada. They charge an average fee of 50 euros per day. Sailors can avoid these marinas as there are places to moor close by for €0. Other, smaller ports may only pay €2 a day for mooring, if there is a fee at all. Free places could be found easily anytime, while in Ithaca or Paxi (Gaios), Kefalonia (Fiskardo), during the high season this could be very difficult. Do you have to moor in every port at the centre of the action? You may be paying to have loud drunks next to you! It may pay in sleep and of course your wallet to anchor a little way off and come into port by dinghy. This may well pay off as the Ionian is so magical wherever you go. Unlike Western Europe we moor stern-to in marinas - this is a trick we look at in our Sailing Guide. Equally you will find quiet anchorages that you can get respite in from the hard living of the major towns. 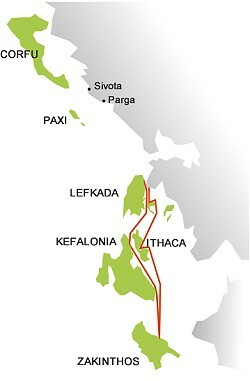 Touring the Ionian islands you will never be far from help, with trips between islands rarely more than around 20km. The climate being perfect for sailing, you still need to be switched on - the price for being completely independent is you’re on your own. 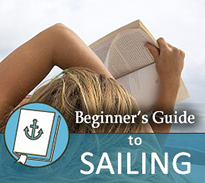 Do have a look at the Kavas Sailing Guide to remind yourself of most common sailing troubleshooting as you go.